AUGUSTA, Ga. -- Where do we go from here? 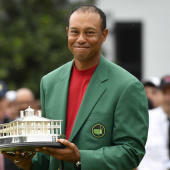 When it comes to Tiger Woods' crazy 2019 Masters win on Sunday, that is the question in the golf world right now. Let's dive in and see what we find. When we ask that question, we're actually asking two questions. The first is about what Tiger does the rest of 2019, and the second is whether he can catch Jack Nicklaus' record of 18 major championships. Let's address them independently. Tiger is now the favorite in the next three majors, and while his betting numbers are always artificially overinflated, these actually kind of make sense. Woods will visit two venues where he's won majors before -- Bethpage and Pebble Beach -- and another in The Open that will almost always be his best chance to win a major in a given year. He's also striking the ball wonderfully. Woods improbably finished first in approach shots at the Masters just a few months removed from finishing first in approach shots on the PGA Tour for the 2017-18 season. There is an argument to be made that he is the best ball-striker on the planet, and a much better argument that the best ball-strikers on the planet double as the most likely golfers to win major championships. It is not hyperbole to say that the rest of this year's majors run through the Cat. That of course doesn't mean he's going to win them. Gone are the days of him being standard deviations better than everyone else. He is now among the 10 or 12 favorites in any tournament he plays. He can't pound the field into oblivion. He needs breaks like the mere mortals he used to pulverize. But still, he's among the best in the game right now, and when combined with his history at some of these courses, it's hard to not see him as the favorite. This won't go on forever, though. Phil Mickelson's age (48) struck me this year at the Masters. It gets Herculean to win majors as you inch toward 50, and Tiger at 43 has probably 20-30 more runs at winning the three majors he needs to tie Nicklaus and four he needs to surpass him. "My last three major championships have been pretty good," said Woods on Sunday. "That in itself gives me a lot of confidence going down the road." So while I still don't think he catches 18, it is -- this feels impossible but is actually true! -- at least conceivable that he does. Four nearly perfect rounds at Augusta National erased 11 years of questions. In maybe his greatest feat yet, Tiger climbed the biggest mountain at a time and an age when most are hanging out at base camp. It doesn't matter what the future holds because Tiger answered every question he's ever been asked with a 70 on Sunday, and only the future can tell us whether he picked up where he left off or if this is an extreme outlier. You could hear it in his voice after the round, though. He downplayed the rest of the season and the rest of his career, choosing instead to stay in the moment. "I really haven't thought about that yet," said Woods. "I'm sure that I'll probably think of it going down the road. Maybe, maybe not. But right now, it's a little soon. I'm just enjoying 15." His tone throughout was an unmistakably familiar one. He's not done here. Pebble Beach is in play. Jack is in play. Everything is on the table. The hunt is back on for Tiger Woods.